Pricing is based on a per person/diver rate and includes to the cost of 5 dives / tanks. The Advanced Certification can be added to any pre-booked dives or dive package with 3 or more boat dive trips. Fees include all training and processing of certification card. 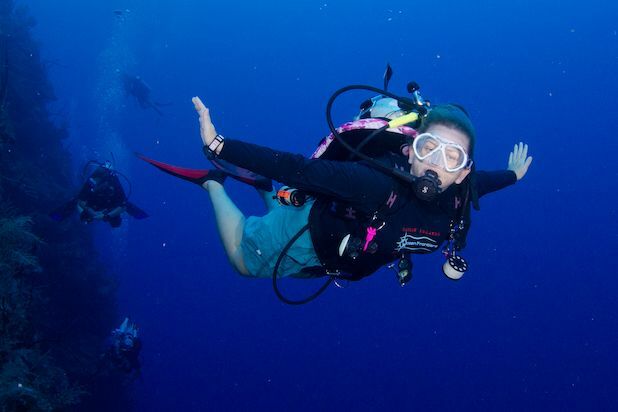 **Ask about our Advanced Premium Class which includes an extra Adventure dive with your instructor. The PADI Advanced Open Water Diver Course online segment includes knowledge development for the two required topics; the Deep and Underwater Navigation Adventure Dives, along with three of the most popular elective dives. These include Night Diver, Peak Performance Buoyancy, Wreck Diver, Boat Diver and Underwater Naturalist. As with the PADI Open Water Diver course, the entire PADI Adventures in Diving manual (complete with all Adventure Dive possibilities) will be available online to divers enrolled in the course. Please note that if you wish to complete the PADI Enriched Air Diver (nitrox) or Digital Underwater Photographer Adventure Dives then the relationship to the Adventures in Diving program differs slightly. You will need to complete the knowledge development for those two programs separately, either through the PADI Enriched Air Online or Digital Underwater Photography Online programs or by purchasing the student manuals from your local PADI Dive Center. Experience real adventure and be one step closer to Master Scuba Diver - the ultimate non-professional certification in recreational diving. Prior to certification as a PADI Advanced Open Water Diver, you must successfully complete at least five Adventure Dives. Two of these are mandatory; the Deep Adventure Dive and Underwater Navigation Adventure Dive. The other three dives that you complete can be chosen from a wide range of Adventure Dives. Why does the eLearning course only cover knowledge development for seven dives when there are actually more Adventure Dives to choose from? Once you finish the eLearning portion of the course, the Ocean Frontiers Dive Center is notified that you have completed it and that you are ready for the practical phase of the program. At the end of the eLearning program, you can print out or save your eRecord and bring a copy of it with you to show your PADI Instructor at Ocean Frontiers.